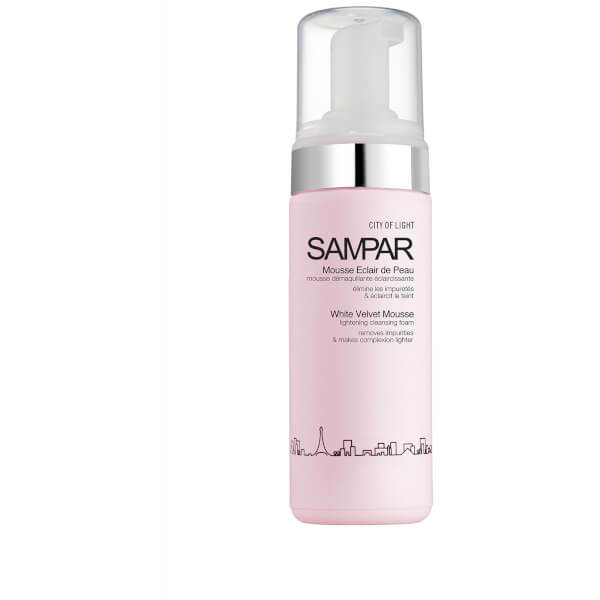 Deeply purify skin with the SAMPAR White Velvet Mousse; an advanced facial cleanser inspired by cosmetic dermatological procedures to deliver a micro-peel action for high performance results. The luxuriously smooth formula transforms into an invigorating lather upon application, with AHA Fruit Acids and Probiotic Enzymes working to reinforce skin’s natural exfoliation process and resurface the epidermal layer, sweeping away dead skin cells and dulling debris to impart a clean, supple texture. Extract of Green Tea delivers brightening and toning properties, while an exclusive Urban Advance Complex brings together Shea Butter Serum, Mint Endorphin and Probiotic Sugar to create a powerful antioxidant shield on a cellular level that neutralises pollutants, free radicals and environmental aggressors. Suitable for all skin types, the cleanser leaves your complexion feeling refreshed, unified and balanced with a youthful looking glow. Apply a small amount of White Velvet Mousse on slightly damp face. Work into a lather by massaging in circular motions. Rinse thoroughly. Aqua (Water), Sodium Lauryl Glucose Carboxylate, Lauryl Glucoside, Sodium Cocoyl Glutamate, Coco-Glucoside, Glyceryl Oleate, Decyl Glucoside, Polysorbate 20, Glycerin, Benzyl Alcohol, Lactic Acid, Potassium Sorbate, Sodium Benzoate, Butylene Glycol, PCA, Citric Acid, Propylene Glycol, Parfum (Fragrance), Dehydroacetic Acid, Glycolic Acid, Malic Acid, Lactilol, Xylitol, Bacillus Ferment, Pyruvnic Acid, Tartaric Acid, Butyrospermum Parkii (Shea) Seedcake Extract, Pentylene Glycol, Mentha Piperita (Peppermint) Extract, Chamomilla Recutita (Matricaria) Flower Extract, Camellia Sinensis Leaf Extract.